Batting: Tamim Iqbal 130 off 160 balls, Shakib Al Hasan 97 off 121 balls, Mushfiqur Rahim 30 off 11 balls. Target: 280 runs in 50 overs. Batting: Chris Gayle 40 off 60 balls, Hetmyer 52 off 78 balls, David Bishoo 29* off 40 balls, AS Joseph 29* off 21 balls. Bowling: Mashrafe Mortaza 4/37 in 10 overs, Mehidy Hasan Miraz 1/37 in 10 overs, Rubel Hossain 1/52 in 8 overs, Mustafizur Rahman 2/35 in 8 overs. After a disappointing test series, Bangladesh aimed to start this ODI series with a win. On the other hand, Windies wanted to keep their winning momentum going by taking the lead in this series. On a pitch, that appeared to be a slow one, Mashrafe Mortaza chose to bat first. Bangladesh openers, Tamim Iqbal and Anamul Haque came out to bat. For Windies, the new ball was shared between Andre Russell and Jason Holder. Holder struck in his first over to remove Anamul Haque as Windies got an early breakthrough in the match. Shakib Al Hasan joined Tamim Iqbal. The pair began to consume a lot of dot balls as Bangladesh scored only 31 runs from the first 10 overs. Post 10 overs, Joseph and Nurse were introduced into the attack. The high consumption of dot balls continued and after 20 overs, Bangladesh had scored only 77 runs. Soon both batsmen reached their half centuries but the run rate still remained below 4 per over. This pattern improved for some time in the middle overs as both Shakib and Tamim found the fence several times in their innings. But overall, the dot ball frequency did not drop. This is when in an effort to get a boundary Shakib departed just three runs short of his century; courtesy of Bishoo. At this point, Bangladesh had 211 runs on the board with only 5 overs left in the innings. Sabbir Rahman joined Tamim Iqbal who reached his century off 146 balls. This partnership lasted only one over as Sabbir was stumped; courtesy of Bishoo’s bowling. Mushfiqur Rahim joined Tamim Iqbal. The pair garnered 53 runs off the last three over as Bangladesh finished with a total of 279 runs. That’s the highest total for Bangladesh in an ODI against West Indies in West Indies. With 280 runs required to win this ODI, Windies openers, Chris Gayle and Evin Lewis came out to bat. For Bangladesh, the new ball was shared between Mehidy Hasan & Mashrafe Mortaza from their respective ends. Like Bangladesh, West Indies also made a slow start. Pressure began to mount up at a steady rate. This resulted in Evin Lewis’s wicket as Mashrafe Mortaza provided Bangladesh with their first breakthrough. Shai Hope joined Chris Gayle. The pair added 14 runs to the total, after which Rubel Hossain was introduced into the attack. 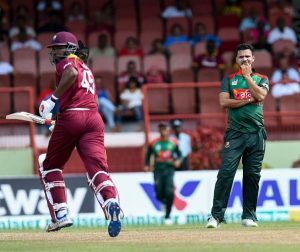 The fast bowler struck on his very first ball by pinning Shai Hope on the pads and providing Bangladesh with their 2nd wicket. Rubel Hossain, right-arm fast medium, comes into the attack. And make us happy 😀 Shai Hope gone for LBW. Hetmyer joined Chris Gayle. 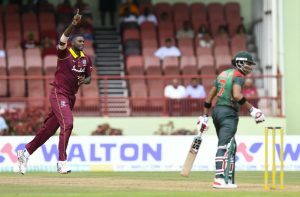 The pair added 40 runs to the total after which the dangerous Gayle got run out and Bangladesh got their third scalp. Jason Mohammed joined Hetmyer. The pair added 30 runs and just as this partnership was looking solid, Jason departed off Mehidy’s bowling. At this point, West Indies required 169 runs from less than 22 overs with 6 wickets in hand. Jason Holder joined Hetmyer. Both batsmen added another 25 runs to the total as Hetmyer reached his half century. Now Mustafizur Rahman was introduced back into the bowling attack. And, he struck straightaway by claiming the big wicket of Hetmyer. Powell joined Holder but he bagged a golden duck as Mustafizur Rahman got his 2nd wicket in a row. 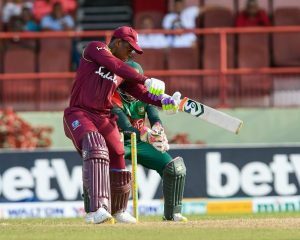 Andre Russell joined Holder but this partnership was broken in the next over by Mashrafe who claimed the wicket of Holder. With this wicket this match(West Indies vs Bangladesh) became one sided. At this point, West Indies had lost 7 wickets and still required 129 runs from 13 overs. Nurse joined Russell who was looking solid with the bat. But, he departed in the very next over to Mashrafe. Bishoo joined Nurse who also fell to Mashrafe in his 10th over. Joseph joined Bishoo. At this point, West Indies required 103 runs from 54 balls. The last two batsmen took the match to the very last over. But, eventually Bangladesh won the match by 48 runs. Bangladesh win smh smh smh ! #WIvBAN West Indies seriously 😒 I’m not pleased ….. The man has something about him. The Bangladesh dressing room needed Mashrafe Mortaza’s presence after their disastours Test series, and now he has also made his presence felt with a 4-wkt haul when it mattered. Big wickets too – Lewis & Russell. This is the end of West Indies vs Bangladesh, 1st ODI. Join Allsportspk on 25th July for the 2nd ODI of West Indies vs Bangladesh.